Unless a person has a lot of experience growing things in all types of soils, they probably could use some advice on preparing a site to grow grass on. There are some right things to do, wrong things and things that depend on your budget and the quality level you want your lawn to look like. Some things will produce a good return for your investment and some may be the right thing to do but not produce a great return for your investment. That’s why one recommendation does not fit for every lawn. A person with an average budget and average expectations will do things differently than a person with a big budget who wants a “perfect lawn.” Proper and improper soil preparation before a lawn is installed will have a huge impact on how a lawn looks and the amount of money it takes to maintain it for many years to come. Proper lawn preparation before the turf is installed costs almost nothing compared to what it costs to correct something done wrong after the turf is installed. A lawn is one of the few things about a home that can last for the life of a home. Removing the turf and establishing new turf on a lawn can be one of the most expensive remodeling projects a person can undertake. My best advice is to select the kind of turf grass you want, and prepare the soil properly to achieve the lawn you desire. Keep an open mind as you read these recommendations, because many people spend a lot of money doing things that are wrong or not worth it. What is soil? Soil is composed of particles of sand, silt, clay, rocks, organic matter, microorganisms and pore spaces. (sometimes moles, too!) Different soils have different amounts of these items. Silt, clay and organic matter are responsible for the soil holding water and nutrients like Nitrogen, Phosphorus, and Potassium. Pore spaces are where the roots grow, the path water takes into the soil when it rains, and most importantly, the pathway of oxygen for the grass plant roots. Sand is mostly a structural part of the soil and holds very little water or nutrients compared to the other components. A soil with just a medium amount of clay will dry slowly and be sticky when wet. Clay soils have more water and nutrient holding capacity than sandy soils. Microorganisms perform the very important function of breaking down and recycling organic compounds like old grass plants and air pollutants that fall to the ground. Rocks and moles are just a nuisance. What is the difference between topsoil and subsoil? At undisturbed locations, topsoil is the soil on top of the ground. It usually contains more nutrients, organic matter and microorganisms than subsoil and will better support plant growth than subsoil. Subsoil is below the topsoil and has fewer nutrients, organic matter and microorganisms, which can make growing plants from seed quite challenging. The purpose of adding topsoil is to increase the water and nutrient holding capacity of an existing soil, but you must be careful when you add topsoil or you can do more harm than good. Why are pore spaces important? Pore spaces are cavities in the soil that allow water to pass through when it rains and are a channel for oxygen to reach the roots. An ideal soil is 50% pore spaces! Construction vehicle traffic, bulldozing a final grade, and dogs running in the same path all compact a soil, which reduces the size and number of pore spaces. Compaction increases when traffic or tillage is performed and when the soil is wet rather than dry. An impatient homeowner demanding that a landscaper rake and install a lawn when the soil is too wet causes tremendous compaction, which greatly affects the lawn for years to come. What does establishment mean when talking about lawns? Establishment is the period of time from when a lawn is started to the point when it will be maintained as a mature lawn. For a seeded or hydroseeded lawn, this period is about 24 months. For sodded lawns, it is about 2 months. Why the difference in time? You have to start from scratch with seed, but you transplant mature plants with sod. Don’t be fooled. It takes a lot of time, work and know-how to grow turf from seed. And, the quality of the soil the turf is growing on, along with the ability of the person growing the turf determines when the turf will be established. What to do to a lawn and what to add to a lawn, therefore, depend on what kind of soil is present and what your expectations for your lawn are. Keeping these points in mind will help you decide what is best for you, as you read through this list. As a general rule, the best dollar you can spend on a lawn is to have the soil loosened up and tilled to a depth of 4 inches. This process breaks up compaction and eliminates pockets of different soils. This mixing of the soil helps make it more uniform. 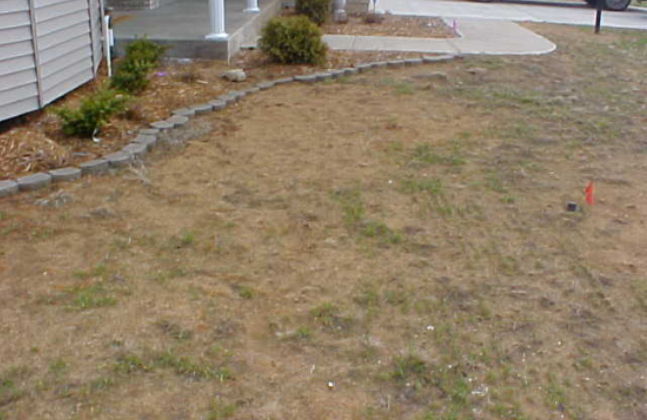 You will have fewer areas of the lawn that are either dryer or wetter than the rest of the lawn. This rutted up lawn is typical of most new homes. The soil needs to be tilled at least 4 inches deep to eliminate soil compaction. An equally important benefit of tilling a soil is to eliminate the presence of different soil layers. Examples of layering would be when subsoil from a basement is spread out over what will be a lawn, or soil is brought in to fill low spots. Different layers of soil interfere with water movement and root penetration. The layer slows down water movement, keeping soil pores filled with water, preventing the roots from receiving oxygen. Grass plant roots do not like to leave one layer and grow into the layer below, thus causing the grass plants to become shallow rooted, which is not desirable. Some people like to mix compost into the soil and if you do, only add about an inch because compost “shrinks” over time and if you add too much, you will find your lawn will become bumpy after the compost shrinks. These two pictures show how normal water movement slows when it reaches a different layer. The water would rather go sideways than down. Do you see why the common practice of adding an inch or so of topsoil to a lawn can do more harm than good? These two pictures show how normal water movement slows when it reaches a different layer. The water would rather go sideways than down. The only exception to number 1 is if you are on loose beach sand. A loose sandy soil is one where a person can take a shovel and easily dig a deep hole. It does little good to loosen up a soil that is already loose. Not all sand is loose sand and, in fact, some sands can be very compacted, which greatly benefit from being broken up. High amounts of clay present mean that soil already has good water and nutrient-holding capacity. So adding topsoil does not provide a long term benefit. If a person has a soil that does not have a lot of clay, and they have high expectations for their lawn, adding two inches of topsoil and mixing it into the soil will provide good benefits. If the topsoil will not be mixed into the existing soil, then don’t apply it, because it would be making a layer. If more than 2 inches of topsoil is added, it becomes difficult to mix it in. If a site were to receive 12 inches of soil, ideally, the soil would be mixed every two to three inches. Adding and mixing soil like this is usually only done on important athletic fields. You can now see why it is difficult to establish a lawn from seed on sandy soils that are mostly subsoils. This soil has poor water and nutrient holding ability. Even turf professionals have a hard time growing grass on sand. Hotter weather makes this task even harder. Some landscapers spread a thin layer of topsoil and leave it on top to improve the chances of seedling survival. If the topsoil is very thick in some places, harmful layers can form. This thin layer offers no long-term benefits and increases the cost of seeding to about the cost of sod. Sod is easy to establish on sandy soils because it is made up of mature plants with growing momentum. need to be fertilized in 4 weeks. This is a seeded lawn on a sandy soil that failed. The owners gave up trying to grow the lawn from seed and had it sodded. Adding topsoil to a poor soil and then seeding nearly equals the cost of sodding, and you still have to grow the lawn from seed. In summary, the best thing you can do for a lawn is to till to loosen and mix the soil. Eliminate different layers of soil by mixing. If you want to add topsoil, do it for the right reasons. Seed and hydroseed are difficult to establish on sandy or poor quality soils especially during hot weather. Sod easily establishes on all soils. This entry was posted in FAQ, Grass Seed, Sod by Red Hen Turf Farm. Bookmark the permalink.